Location/ Directions: From I-81, Exit 8 -- turn right onto 25E North 6 1/2 mi to Morristown/Exit 2B, Turn Right, Property is 400 yds on the left. 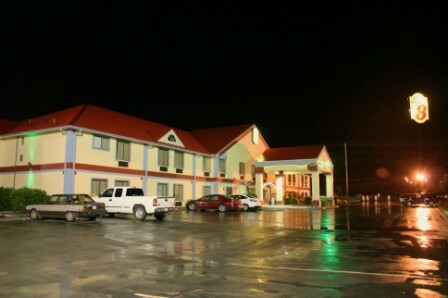 About Hotel: 2-Floors, 63-Rooms, Free Continental Breakfast, High Speed Internet Access, Bath Tub, Shower, Hairdryer, Free Local Telephone Calls, Air Conditioning, Alarm Clock, Cribs Available, Desk, Self controlled Heating/Cooling, Iron & Iron Board, Free Newspaper, In Room-Coffee/Tea Maker, Microwave, Refrigerator, Flat screen Cable/Satellite TV, Pets Allowed. Food: Cracker Barrel across the street and Hardees next door. Railroad View: Good View from 2nd floor rooms on the front of the motel. 1st floor rooms maybe OK as long as automobiles in the parking lot do not block the view. The railroad is a few hundred feet from the motel across a field. Windows do not open; best way of hearing an approaching train is by having a radio scanner tuned to the NS frequency (160.950). Trains call signals, MP 223.8 signal is just north of the motel. Other than a passing headlight, you can not see train's at night from this motel. Railroads past Hotel: Norfolk Southern Railway. Located just south of the MP 223.8 signal. This is Norfolk Southern’s S-Line which may see 10-14 train's during a 24-hour period. However, I arrived this motel on Labor Day, and didn't see a train until 8:41am the next day; I slept well; so maybe I missed some overnight. The busier double tracked A-Line is located across town. 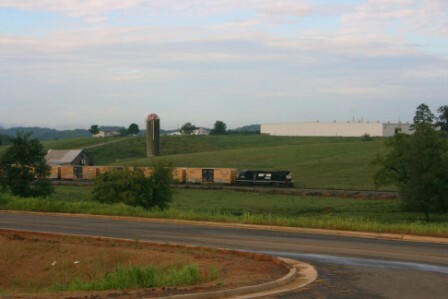 Photo Comment: Below Left: A northbound Norfolk Southern local freight with 10-boxcars passes the Super 8 motel. This photo was taken from the parking lot with an 85mm lens. The road in the foreground is not a very busy street, if you know that a train is nearby you can achieve a pretty good picture of a passing train. This was the only train I saw during my 13-hour "Labor Day holiday" visit. 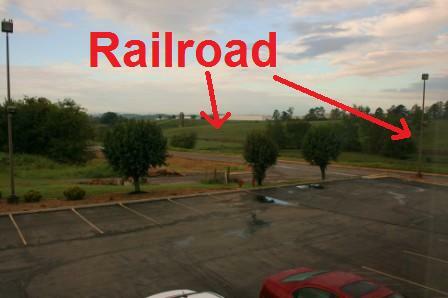 Below Right: A photo taken from 2nd floor room # 208 shows the railroad view from the motel. Some trees prevent an excellent view, but a zoom lens or video camera can capture passing trains from the motel.